Your gun is your pride and joy so you need a case which protects your gun not only during storage but transport too. There is no point in having a case that your gun doesn’t fit into or knocks around in. 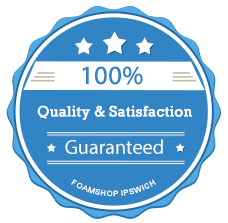 The Foam Shop has a range of case foams suitable for making gun cases from, which include; egg-box case foam, high load bearing foam and plastazote which is a closed cell foam and water proof. The packaging foams are either black or grey in colour and we can cut to any size or shape of your case. We can also offer an aperture cutting service where we can cut out the shapes in the foam for your gun to sit into. This would have to be done by seeing the case and item or having exact measurements and possibly a template. Being uncomfortable isn’t one of the things you need to be thinking about when looking to make an accurate shot, so why not have new comfortable and supportive cushions made for your shooting trailer. We would recommend the Regal Luxury or Reconstituted foams for this purpose, they would both give you the long last comfort you would be looking for. We could also make new covers for you from a wide range of PVC’S, Vinyl’s and canvasses. We could include fitted zips, Velcro fastenings or press studs which make attaching your cushions even easier. Shooter bean bag are relatively new to the shooting world. But why do you have to be uncomfortable whilst outdoors? The new bean bags are smaller that the typical bean bag and are easy for you to carry around. For those of you who are wondering about whether you can use a bean bag during a HFT competition, the official rule is that the bean bags can be carried to place guns on between lanes and may be used for kneeling shots, as long as only the knees are placed on the bean bags. This is not a stock item for us currently and we would make each one to order. If you are interested you would need to contact us, via email and we could notify you of the price, colour options and manufacturing time. Contact us today with your sizes and requirements by clicking here.